Da Hoss (foaled January 18, 1992) by Gone West (by Mr. Prospector) out of Jolly Saint (by Welsh Saint) is a bay Thoroughbred gelding bred in Kentucky by Fares Farms and originally owned by Prestonwood Farm as well as Wallstreet Racing Stables. 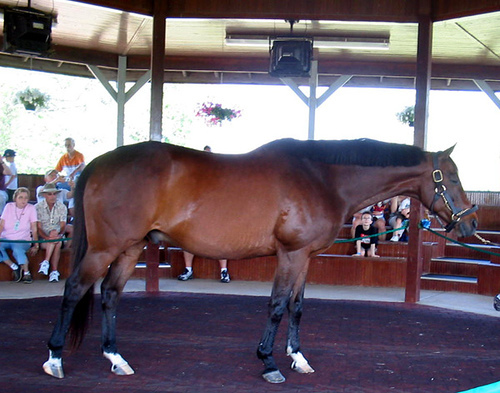 Bought for only $6,000 as a yearling at the Keeneland Sales, by Kevin Eikleberry. Da Hoss was then taken to Turf Paradise, in Phoenix, AZ, where had 3 wins in 3 starts at two years of age. He even rocketed six furlongs in the record time of 1:071/5 at the age of 2. At three, he took the Grade III 'Best Turn Stakes (now known as the Jimmy Winkfield Stakes, the Grade II Jersey Derby, the Grade II Del Mar Derby, and came second in the Grade II Gotham Stakes, Illinois Stakes, Swaps Stakes, and Pegasus Stakes. When he was four, he won the Grade I Breeders' Cup Mile, now known as the Breeders' Cup Turf Mile, under Gary Stevens, the Grade I Fourstardave Handicap, and the Pennsylvania Governors' Cup. And at six he again won the Breeders' Cup Mile. The Breeders' Cup Mile at six was done with serious true grit since Da Hoss had always suffered from foot problems, and after his win in the 1996 Mile by one and a half lengths, he was out of racing for almost two years: 1997 and 1998. He had only one prep race for the 1998 Mile and that was an allowance which he easily won. And then he came back, ridden by John Velazquez, to take his second Breeders' Cup by a nose to Hawksley Hill in a truly thrilling stretch battle. Tom Durkin, announcing, yelled, "Oh my, this is the greatest comeback since Lazarus. He's had one race in two years." The comeback of Da Hoss is considered by most sports writers as the biggest comeback of all time. n his twenty starts, Da Hoss won 12, placed in 5, and came home third twice. His career earnings amount to $1,931,558. Until Ouija Board took her second non-consecutive Breeders' Cup win in 2006, he was only one of six horses to ever win two Cups, and the only one to win in non-consecutive years. Da Hoss now lives at the Kentucky Horse Park in the Hall of Champions.